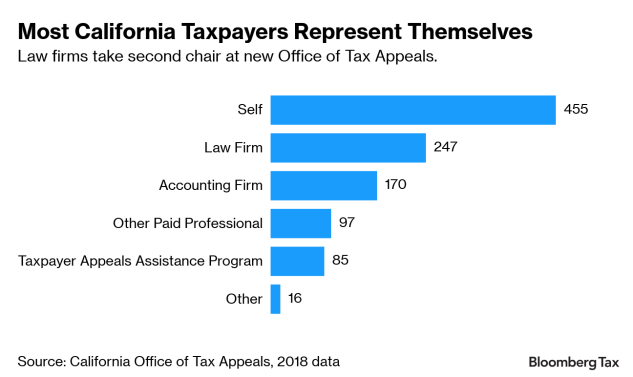 California's year-old Office of Tax Appeals gets high marks for taking the politics out but practitioners say it's too soon to call it a success. 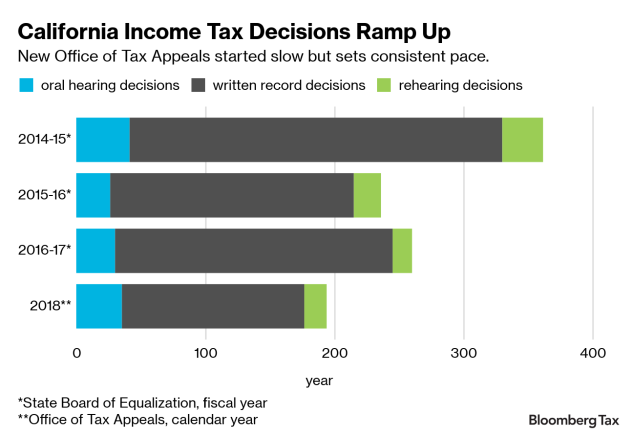 Win and loss rates for income tax cases at California’s year-old Office of Tax Appeals are running similar to its troubled predecessor with one huge difference: The politics are gone. Data from the OTA and other sources analyzed by Bloomberg Tax also show cases are flowing in and out at similar rates compared to the former State Board of Equalization. The appellate office was created by lawmakers Jan. 1, 2018, with a mission to issue fair, objective, and timely rulings, ridding itself of the pay-to-play culture that dogged its predecessor agency. It’s difficult to compare the OTA’s progress directly with the equalization board, which didn’t track cases with as much precision in the 90 years it handled administrative tax appeals. So far, the data shows, taxpayers are faring slightly better in winning appeals compared to the old system. Results are still too limited to declare success, but practitioners have applauded that they no longer have to curry favor—or make campaign donations—to win their cases. “I don’t know the political affiliation of the members of my panel,” said Jesse McClellan, a sales and use tax firm principal from Sacramento who argued his first case before an administrative panel in December 2018 and expects a decision in March. Before the OTA was created, California’s five-member elected State Board of Equalization was the only body of its kind in the country. Its members administered the sales and use tax and adjudicated administrative tax appeals involving those same taxes plus appeals involving franchise and income taxes administered by the Franchise Tax Board. Lawmakers and former Gov. Jerry Brown (D) stripped the equalization board of most of its authority in 2017 following audits and news reports about legal and ethical lapses among the board members. The tipping point for lawmakers was a 2017 audit from the Department of Finance’s investigations unit that found some board members were breaking state law by reassigning employees such as auditors to non-revenue tasks such as staffing conferences that served to promote the members. Employees reported to investigators that board members pressured them to alter audits or collections to benefit their constituents and threatened staff members who didn’t go along. The audit report came after a 2016 examination by Bloomberg Tax found two board members solicited charitable contributions to nonprofit organizations—one of them founded by a board member’s wife—from companies and individuals with business before the board. They used the contributions to host conferences with few ties to their tax duties to promote themselves, with some sessions that included religious themes. The members enlisted tax agency staff to plan and run the conferences. Earlier, a 2010 series of stories by Bloomberg Tax found sophisticated taxpayers with complex cases were more likely to win their tax appeals if they made campaign contributions to the elected board members. As part of the breakup, lawmakers created the OTA as an independent appeals body directly under the governor. Panels of three administrative law judges issue written decisions based on oral hearings, or based on the written record if taxpayers don’t request hearings. Administration of the sales and use tax, along with more than 30 other taxes and fees, is now handled at the California Department of Tax and Fee Administration. The new office hasn’t issued many meaty rulings yet, leaving California tax professionals wondering if taxpayers can win against the state when most of the administrative law judges deciding appeals were hired from the Franchise Tax Board and California Department of Tax and Fee Administration. Although OTA isn’t tracking the win-loss ratio, its own data and information from other sources indicate the win-loss ratio may not be changing much so far. According to the California Taxpayers Association, which mainly represents corporations and businesses, in 2018 the judicial panels ruled unanimously in favor of the the state in 176 opinions and in favor of the state but with some concessions in two opinions. Those state wins are 92 percent of all 2018 opinions posted. Taxpayers have prevailed wholly in four and partially in 12 of the 194 opinions posted, according to Cal-Tax. Cal-Tax’s analysis shows better odds for taxpayers than a review the Franchise Tax Board did in September that found the OTA ruled fully or partially in favor of the board 97 percent of the time, board spokesman Chris Smith told Bloomberg Tax. By comparison, tax board research showed the equalization board ruled in its favor in whole or in part in 98 percent of appeals it decided based on the written record between 2012 and 2017, Smith said. In cases that went to an oral hearing at the board in those years, the FTB won about 80 percent of the time. A Bloomberg Tax analysis of OTA opinions from 2018 found the board won in eight oral hearing opinions, won but had penalties or interest abated in two cases, and was overturned in one case. In this small sample of opinions from oral hearings, the board won in whole or in part 92 percent of the time. As another point of comparison, the Internal Revenue Service won in 76 percent of opinions from the U.S. Tax Court in 2018. Most of the rulings so far have involved small amounts and well-trodden issues such as late filing penalties, the tolling of the statute of limitations, innocent spouse relief, or head of household status. And data from the OTA also shows that about 90 percent of cases are resolved before they reach the opinion stage. Some practitioners say they are withholding judgment until they see more sales and use tax cases, how many decisions will set precedents, which documents are made public, and if accountants can run afoul of prohibitions against practicing law if proceedings are too much like a court. Creation of the OTA ended the political calculations practitioners made when they took cases to the elected board, such as knowing the number of Democrats and Republicans, and which board members might be a swing vote. Practitioners told Bloomberg Tax they don’t mind that they no longer have to decide whether to meet privately with each of the board members to press their clients’ cases in advance of hearings. They also don’t mind the end of pressure from some board members to make contributions to their campaign funds or favorite causes. Practitioners said the office has overcome growing pains to establish a smooth, relatively transparent system with responsive staff members to handle its caseload. 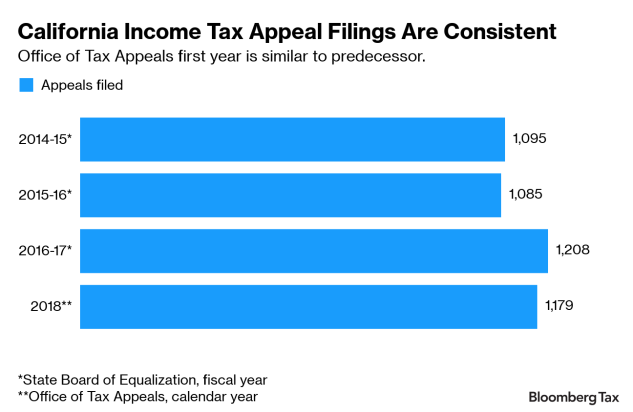 The annual inflow of income tax appeals is similar to what it was at the State Board of Equalization, and the outflow of income tax decisions is lower but ramping up, according to data provided by OTA. No opinions were published between January and April 2018 while the office was getting established. Since April 2018, the OTA has been posting about 21 opinions a month, which is the same monthly average as its predecessor in the 2016-17 fiscal year. Taxpayers representing themselves at the OTA are the most common, according to the office’s data. The findings may address concerns that it be informal and accessible to all taxpayers regardless of the complexity of their case or their ability to pay someone to represent them.